Planning a last minute Camino this year? We have selected four great Camino routes for Autumn. 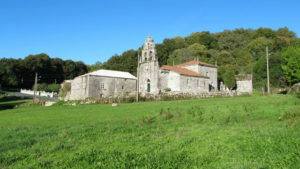 September is a very busy month on the Camino Francés; particularly the last section from Sarria to Santiago. This means accommodation options can be limited. However, there are many other fantastic Camino routes to be discovered, perfect for Autumn pilgrims. Along these Camino routes you will encounter a much smaller number of pilgrims but the same sense of camaraderie that makes the Camino such a special journey. Why choose this Camino route? The last section of the Portuguese Way or Camino Portugués is the second most travelled Camino route after the Camino Francés. It is very well marked and a popular choice for walkers who would like to meet fellow pilgrims but avoid the busiest paths. You will get great views of the Bay of Vigo as you reach the Atlantic coast in Redondela and again as you approach the fishing village of Arcade, where you can enjoy a last blast of Summer weather. The cathedral town of Tui and the historic city of Pontevedra are other must-see highlights on this Camino route. When to go: travel in September to enjoy the last blast of Summer in Galicia. Trip details: Portuguese Way from Tui. Why choose this Camino route? This is a unique Camino route as it is the only one starting in Santiago de Compostela. The trail takes pilgrims all the way to Cape Fisterra, by the Atlantic Ocean, and then on to the fishing village of Muxía, along the rugged and magnificent Costa da Morte coastline, home to pristine sandy beaches, picturesque lighthouses and superb seafood. Muxía’s iconic sanctuary by the ocean hosts its most important festival in early September. It is an opportunity to discover the region’s fascinating traditions, mixing religious and pagan myths and rituals; such as those associated with the rocking stones by the sanctuary, believed to have curative powers. When to go: early September to catch the unique Virxe da Barca festival in Muxía village and go for a swim in Lires beach. Why choose this Camino route? The Original Way or Camino Primitivo is the oldest Camino route, taken by King Alfonso II in the 9th century on his pilgrimage from Asturias. 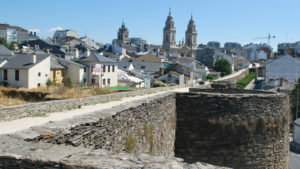 The second section of this Camino route starts in the walled city of Lugo, home to a spectacular UNESCO-listed Roman wall wrapped around its historic centre. Lugo is known for its famous wall but also for its great food (including free pinchos in many of the bars in the old town) and for the San Froilán festival in October. Originally an agricultural fair, San Froilán is still one of the most unique places to try Galician-style octopus or ‘fair style octopus’ (as it is known in Galicia). When to go: early October to experience the traditional San Froilán celebrations in the city. Trip details: Camino Primitivo from Lugo. Why choose this Camino route? The last section of the Via de la Plata route is probably one of the most rural, peaceful and beautiful. With Ourense city getting some of the hottest Summer temperatures in the country, the best time to discover this section starting in Ourense is Autumn or Spring. Before your trip, you can take a day to enjoy the city’s famous outdoor hot springs (termas). If you travel in November, make sure you arrive in time for the city’s ‘Magosto’ traditional chestnut roasting event taking place on St Martin’s Day, 11th November. When to go: October for mild temperatures or arrive in Ourense on 11th November to take part in the ‘Magosto’ chestnut festival. 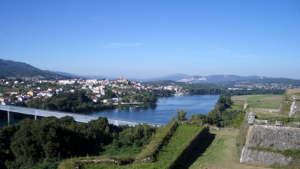 Trip details: Via de la Plata from Ourense. *You might also want to read our blog posts: What are the busiest months on the Camino? and Most popular Camino routes. There is still time to make to Santiago this year! For more information about the best Camino routes for Autumn or to book your trip, contact our Camino specialists.